If your pitchers throw great in practice and struggle in games this off-on drill will help. The pitching rubber represents pressure to most pitchers – but not after using this simple drill. That little white strip of rubber can really wreak havoc with a pitcher’s mind. The pressure associated with pitching and the critical ghosts of the past all come back to haunt a pitcher as soon as she steps on that little strip of rubber. Telling a pitcher to relax just doesn’t work. To really help a pitcher “relax” she has to literally feel how tense she becomes when she stands on the rubber. And to do that, I’ve starting using what I call the Off-On Drill. Once your pitcher is warm and pitching at full distance, have her stand just off to the side of the rubber (OFF) and throw a pitch to the catcher. On the next pitch, have her stand ON the rubber and pitch. She’ll quickly notice how she’s tenser on the rubber than off of it. Ask her where she feels the tension – is it in her shoulders, her arms, her calm (her insides) – and then have her step OFF and pitch – and have her notice how she’s still throwing hard, but calmer and less tense. Rotate every other pitch OFF then ON 4 to 5 times until your pitcher can imitate the calmer version of herself when she’s standing ON that little white strip of rubber. 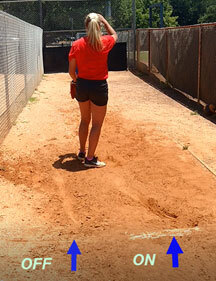 The Comprehensive Pitching Blueprint (eClinic 022) – If you’re a Vault Classic Member this is already in Your Account. Get all of our Pitching eDrills when you become a Vault Classic member and get it all! !